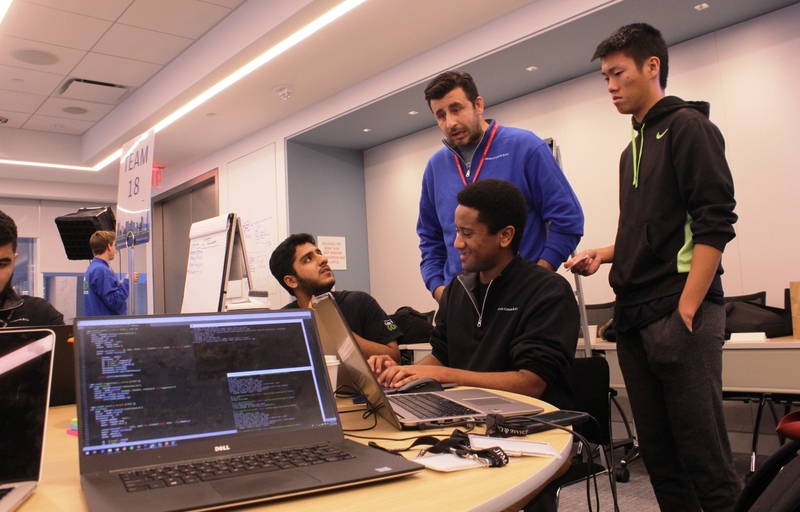 In late October, 125 computer science students from across the United States gathered at JPMorgan Chase’s Jersey City office for the Code for Good hackathon. At this competition, a panel of environmental non-profits presented issues, such as promoting sustainable behavior and tracking park visitor patterns, as prompts for teams of students to construct digital prototypes. Creating software to address resource use and conservation challenges can both inspire computer engineers to engage in social and environmental activism and provide instrumental products for conservation. In a high-rise just across the Hudson River from Manhattan, a conference room echoed of clacking keyboards as fluorescent lamps glared down on whiteboard scribbles and hunched shoulders. This was no research lab or policy-changing legislative office, and about as far from a natural landscape as one can get. So what did this hackathon have to do with conserving natural resources or combating climate change? Hackathons have risen as a method to quickly produce software products for environmental applications. Typically over the course of a marathon day or weekend, teams of participants, usually experienced coders, conceptualize an idea or design, tirelessly work on it, and then pitch the product (or at least the most complete version they have made) to a panel of judges or the other participants. Programmers lost in thought troubleshooting a code bug. 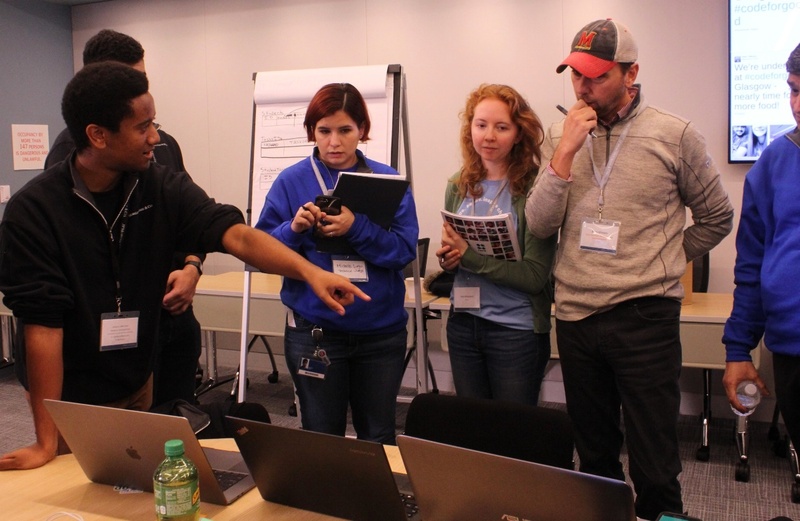 Hackathons engage the talents of young software engineers in environmental or other causes, which can both inspire the engineers and result in usable products. Image by David Klinges for Mongabay. 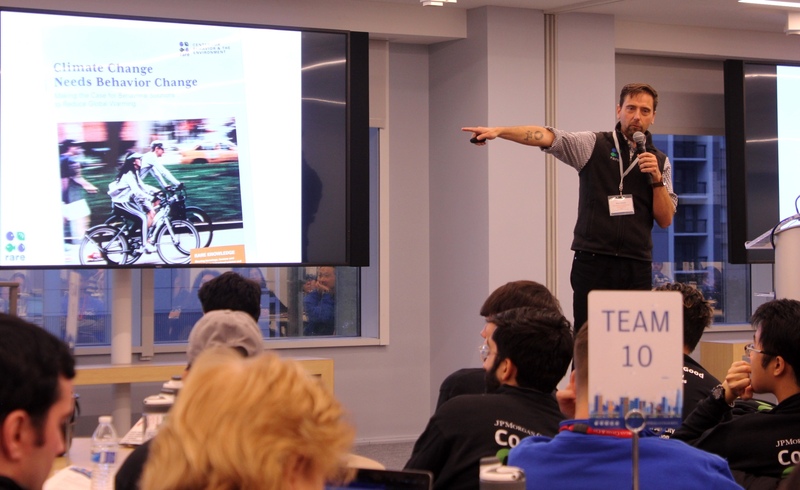 In late October, JPMorgan Chase (JPMC) hosted a hackathon in Jersey City, New Jersey as part of its Code for Good series. Bright young software engineers from across the United States came together to brainstorm technological solutions for environmental non-profit clients. After being selected via a competitive application process, 125 undergraduate students participated in 18 hours of non-stop computer programming. Independent initiative and drive are critical to maintain focus throughout the long night, but so is cooperation, as students are assigned to teams with complete strangers. During the opening introductions of each Code for Good event, a panel of non-profit representatives presents the problems they face that could potentially be addressed by a software solution, and student teams use this information to conceive tools or applications. At this hackathon, the non-profits ranged from the Central Park Conservancy, a local group vested in preserving New York City’s Central Park, to Rare, a multinational environmental organization that targets protection and sustainable use of natural resources across the globe. Student coders listen attentively during the Code for Good hackathon opening remarks. Image by David Klinges for Mongabay. 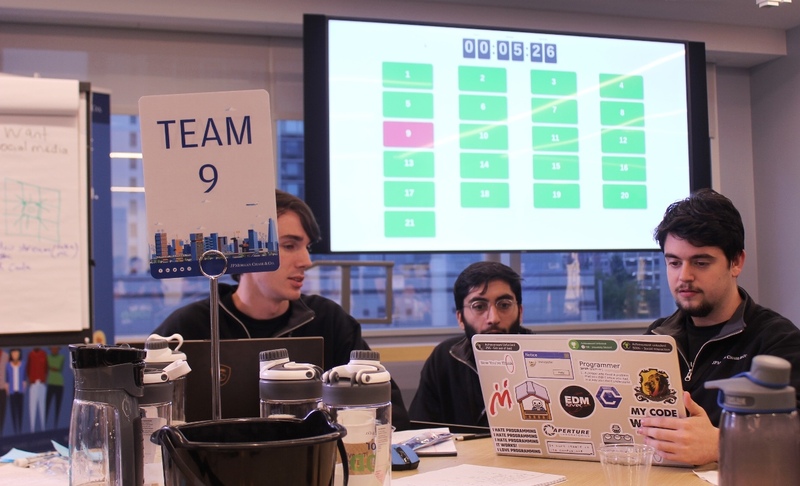 In the Jersey City event, Rare challenged student competitors to design a product that could encourage broad adoption of sustainable behaviors in everyday life, an intentionally broad prompt to allow creative coding freedom. 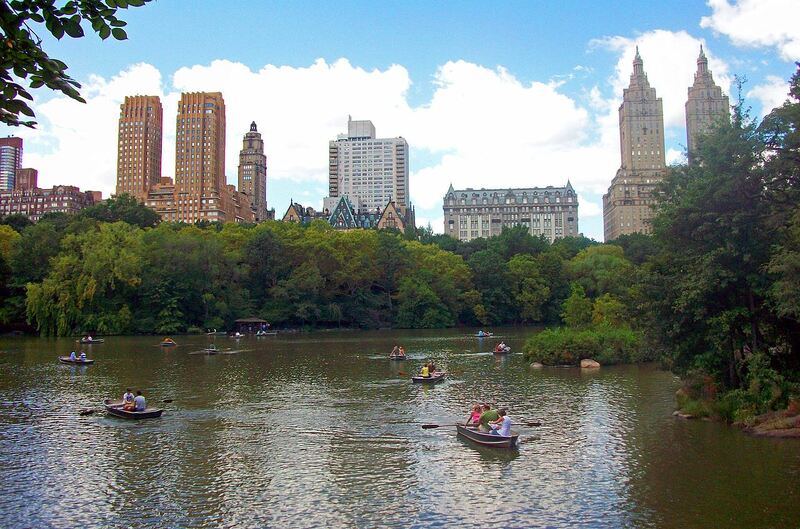 The Central Park Conservancy asked for a method to collect data on where visitors go and what they do during their time in the park, which could help the Conservancy set funding priorities. Visitors to Central Park in New York City enjoy the lake and views of historic properties of the Central Park West Historic District. The Central Park Conservancy asked the Code for Good hackers to develop a method to collect visitor data to help set funding priorities. Image by Daniel Case via Wikimedia Commons (CC 3.0). Students of Team 18 were attracted to Rare’s pitch. Their aim was a mobile app to engage university students in competitions to build sustainable habits such as recycling plastics and taking shorter showers. Logging such behaviors would rack up points for one’s school on a national leaderboard. “We’re not targeting environmentalists per se, we’re trying to target everyone else,” said Nahum Getachew, who attends New York’s Columbia University. 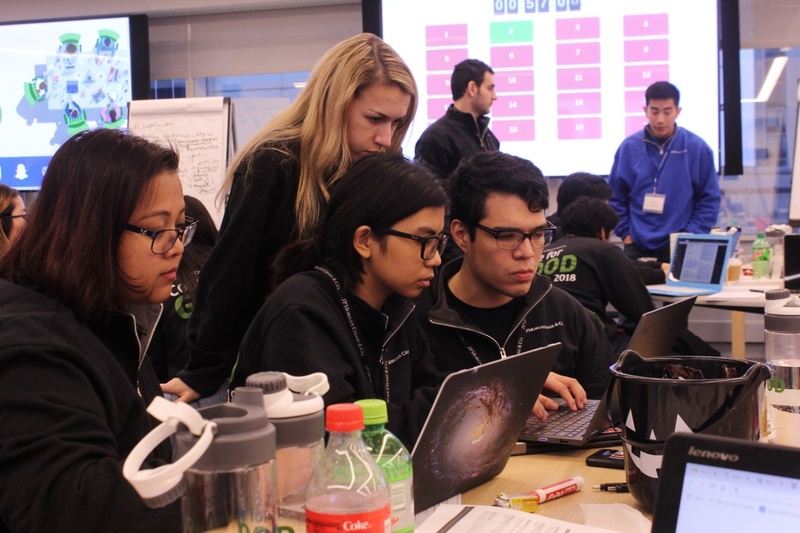 Karim Sabar of the University of Texas, Austin, added, “If you see your school at the bottom of an environmental leaderboard…that’s going to give a really bad impression.” After brief deliberation, the team settled into their seats and began coding away. Software engineers are armed with skills and tools that many career conservationists may not have: as digital architects, for example, they can build applications that take advantage of existing online platforms. The combination of tapping into social media networks and providing challenges, reflected by Team 18’s target product of a mobile app leaderboard, are “two elements rooted in behavioral insights,” said Brian Ullman, Vice President of Marketing and Communications of RARE. “Gamification of the process is one of the best ways to motivate human behavior,” which in this case, could result in sustainable habit-building. Brian Ullman of Rare challenges student teams to develop a product that incites positive behavior change. Image by David Klinges for Mongabay. Rare’s original charter was rooted in endangered species preservation (hence, rare) through pride promotion campaigns, and the group now focuses on adjusting human-environment interactions. In August 2017, Rare opened its Center for Behavior & the Environment to support activities and technologies that foster behavioral change. Nahum Getachew of Columbia University pitches his team’s product to Rare staff. His team developed a mobile app that pits university students against each other to earn points for building sustainable habits. Image by David Klinges for Mongabay. A prominent example of successful use of technology– in this case, social media– and human competitive nature for a charitable cause was the ALS Ice Bucket Challenge, a 2014 activism campaign. As a bystander filmed, an individual would dump ice-cold water on himself/herself and post the video to a social media platform. This would give the frozen challenger the right to demand three friends to do the same within 24 hours or donate to a research foundation on ALS (Amyotrophic Lateral Sclerosis). In August 2014 alone, the ALS Association received around $100 million, over five times the sum of donations from the previous fiscal year. Targeted hackathons like Code for Good capitalize on that same competitive nature by pitting hackers against each other to kindle new ideas. Social good hackathons have caught on in the past decade, and high-publicity global events are held annually. During the fourth annual Fishackathon, which took place in 40 countries worldwide, teams created products to improve the sustainability of marine systems. The global winner built a sensor that could be deployed in marine protected areas to detect illegal poaching activity up to 50 kilometers (31 miles) away and alert local authorities. JPMorgan Chase recognized the potential for positive impact (and public relations) by adopting a hackathon series, and launched Code for Good in 2012. Conservation practitioners have encouraged such collaborations with finance and technology institutions, as well as with the public, to achieve sustainability, research, and protection goals, including development of hardware and program software for the explicit purposes of sustainability and natural resource conservation. 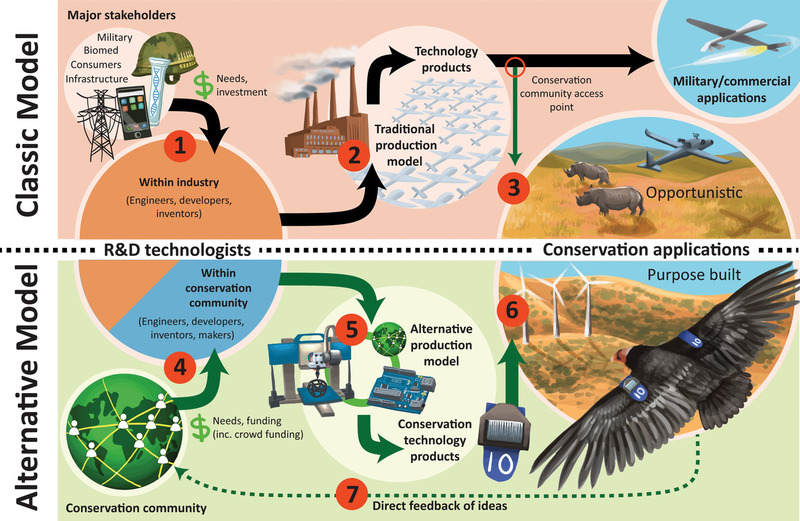 Schematic of how technology development for conservation might shift from a “classic” model of the conservation community adapting mass-scale technologies built for and within other industries to a new model that uses affordable designs and components that allow small-scale production for conservation-specific products. In the classic model (top), the demand and needs of large institutions such as governments or the consumer electronics market, drive technological development. In the alternative model (bottom), lower-cost components, communications and transport enable creation of specialized products with a global reach, as well as direct collaboration between the conservation community and technologists. Themed hackathons such as Code for Good can plant to seeds for this novel model. Image and modified caption from Berger-Tal & Lahoz‐Monfort (2018) “Conservation technology: The next generation.” (Drawing by Elia Pirtle). After a long night of coding, late-night pizza, and enough caffeine to keep a small village awake, Team 18 had nearly completed their design of a sustainable behavior app. Their plan had taken a winding course with a fair number of roadblocks, and crunch time was nigh. With minutes to spare, they submitted their software designs and breathed a sigh of relief. The dash in the final hours to complete a functional prototype yielded a mix of smiles and grimaces from Team 18. Image by David Klinges for Mongabay. Six of the 21 teams competing were named finalists, and Team 18 was one of them. Another quick dash to throw presentation slides together, and they found themselves on a stage pitching their product to the entire student audience and panel of judges. 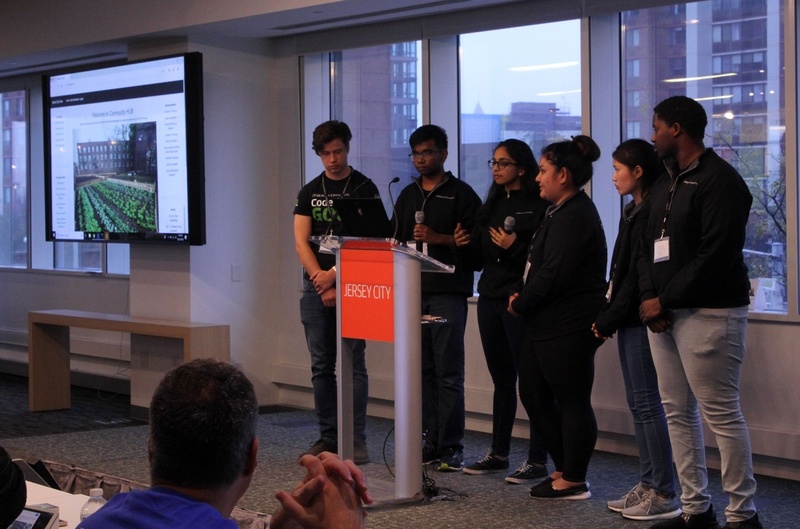 Other finalist teams had produced a data-harvesting survey of Central Park visitors, a website dashboard for non-profit administrators to effectively manage volunteers, and a map display of environmental activism and community gardening events. The final seconds slip away as the last team struggles to submit their software design. Image by David Klinges for Mongabay. The judges then convened behind closed doors to discuss the projects. Who would take the grand prize? It was Team 1, which had designed a mobile app that surveyed visitors to collect data on Central Park attractions and pulled data on visitors from the Instagram photo application. After two long days, the sleep-deprived students stumbled onto their planes to return to Monday classes, but it is not the end of the line for their new prototypes. Over the next eight months, JPMC’s Technology for Social Good team will continue to collaborate with the non-profit clients to gauge what they need and synthesize the most effective components of student software into functional systems. Although 24 hours may not be enough to enact longstanding change, such hackathons sow the seeds of creativity that then sprout into a fully blossomed product. 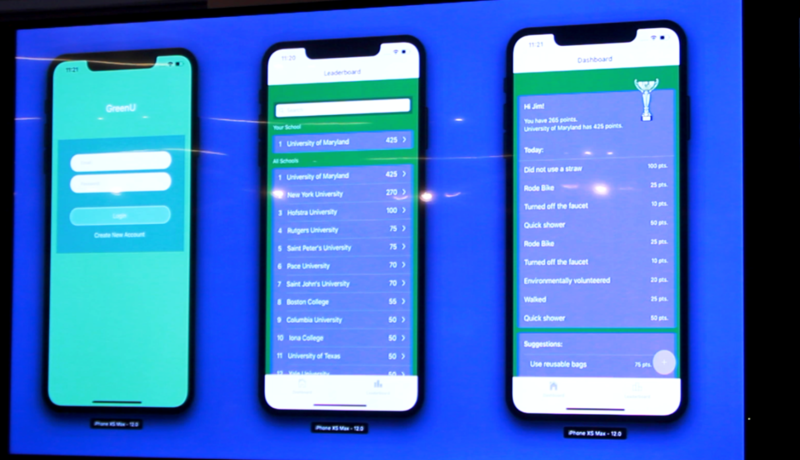 One of the finalist prototypes from the Jersey City Code for Good Hackathon: a phone app that rewards points on a leaderboard to universities and students for environmentally sustainable habits. Image by David Klinges for Mongabay. One of the finalist teams presents their web application to the audience. 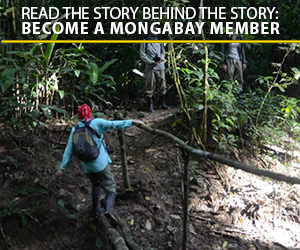 Image by David Klinges for Mongabay. In the realistic near future in which almost all college students will receive instruction on computer science, a generational cadre of coders for social and environmental good is not far-fetched. Berger‐Tal, O., & Lahoz‐Monfort, J. J. Conservation technology: The next generation. Conservation Letters, e12458.